I’m a bookseller and book reader, whose love for books is not quite matched by the time I have for reading them. 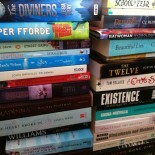 There are always more books in my endless to-read pile. Sometimes, I take the time to document what I’m reading and let you know what I’ve liked and disliked. All opinions are my own and I make no promises about how witty and interesting I might be.